One of the questions we are debating in Kelly Rossum’s Jazz 201 class at MacPhail is the definition of jazz in a 21st century context. British writer Stuart Nicholson poses the more pithy question in the title of his book, Is Jazz Dead (Or Has It Moved to a New Address)? 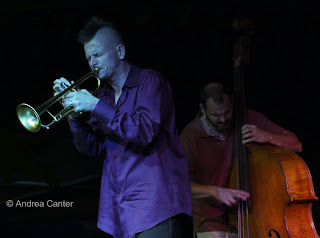 The controversy—the growth or demise of jazz, depending on your point of view—has been around since at least the bebop era, when dance bands and swing music fell on hard times post World War II, when rock ‘n roll replaced swing as America’s popular music, when bop erupted as a true art form in search of an audience that would perceive it as a cultural phenomenon and social commentary rather than mere entertainment. If you were young and hip and seeking “cool,” then the odd rhythms, dissonant harmonies and ridiculously fast tempos of bop opened the door to the future of jazz. For others, bop was the death knell of the genre. Fifty years later, we are still debating the vitality, even the definition, of jazz. Tribute to Leigh Kamman at the Artists Quarter. 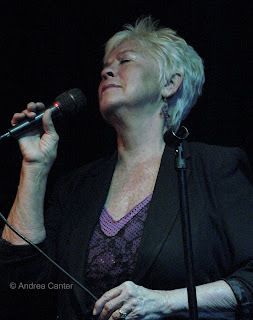 Celebrating the career of retired broadcaster Leigh Kamman, the Artist Quarter welcomed crooner and Bing Crosby expert Arne Fogel, balladeer/torch singer Carole Martin, vocal innovator Bruce Henry, and bop masters Dave Karr, Dave Graf and Brad Bellows. Martin, whose public gigs are too few and far between, sang one of her signature songs, “Blame It On My Youth,” with timeless emotion. It’s not a new tune. It’s not a new style. But can music that grabs your 21st century heart be dead? Or even retro? What about Bruce Henry’s shattering interpretation of “Afro Blue?” Using the human voice as a horn is no longer innovative, yet Henry finds new sounds, new phrases, his incantation taking a yodeling quality like no singer I’ve heard, at once rooted in an ancient land and seeking a new world. Benny Green and Bucky Pizzarelli, live recording at the Dakota. 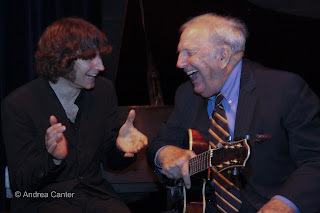 Revealing swing at its most lyrical and dynamic, pianist Benny Green and guitarist Bucky Pizzarelli, two generations apart, united at the Dakota as the most sublime and sympathetic pairing in years. No argument here that the music is drawn from a past era of Gershwin, Basie and Ellington. So why does it matter so much in 2008 that music of the 30s still shines? Are we only admiring a past glory or are we captivated by the spontaneous joy that even “old” music can inspire? It is said that jazz is never played the same way once. The same notes can have new feeling; the same tune can be given new notes, new harmonies, new rhythms. Jazz is only dead if it is repeated. Charlie Haden/Carla Bley, Liberation Music Orchestra at Ted Mann. Taking the form of the 30s regional big band infused with social justice messages and modern harmonies, Charlie Haden, Carla Bley and a masterful cast brought a mid-century format to the new millenium’s political quagmire, and the result transcended both. “Old music” from Dvorak to Metheny to “Amazing Grace” and “American the Beautiful,” when arranged by Bley in the context of one of the most critical elections of our time, stirs new fears, new resolve. Art remains viable if it continually elicits emotional response. Kelly Rossum Quartet, CD release at the Artists Quarter. One moment playing out, the next moment paying homage to Miles, the next moment giving elegant lyricism a 21st century glow, Kelly Rossum and his quartet celebrated the release of Family. Some consider this a more conservative recording than Rossum’s earlier Renovation and Line. Some consider it his most adventurous yet. The music is deceptively accessible, often melodic, typically transparently rooted in the history of the music much as our lives are rooted in the histories of our family, our culture. New compositions from Rossum, Bryan Nichols and Chris Bates aren’t so “out” to leave the listener in startle mode, but well tethered on earth where one might more readily interpret the feelings evoked. Yet interpretation of the most standard composition, “If I Were A Bell,” rearranges, reconsiders, restructures those “old notes” with new messages. Jazz has always been about bringing different, even ancient, threads together to weave new fabric. While the preservationists (aka “neoclassicists”) fear jazz has moved too far from its roots in blues and swing rhythm, others fear there is too little spontaneity and innovation among today’s practitioners. Some critics listening to the above performances would declare that “there’s nothing new under the sun,” a symptom of the pending demise of jazz. Yet, using only one weekend in the Twin Cities as the point of reference, if the individual sounds were anchored in the works of earlier masters, the existence of so many directions for those sounds, under the umbrella of one genre, seems itself an innovation and fundamental to the definition of jazz. And is the transparency of heritage a negation of creativity? Surely Stravinsky was swayed by Bach, even if Johann himself would have difficulty finding his footprint in Igor’s sandbox.